Trains have always fascinated people, especially steam-driven locomotives of a bygone era. Agatha Christie’s 1934 mystery novel Murder on the Orient Express gave readers an insight into luxury rail travel and enhanced the allure of rail travel , besides the macabre drama. The train is a pleasant way to travel. Even a boring train journey may have a fascinating story to tell. Although these amazing mechanical creatures of the Industrial Revolution have been despatched to the scrapyard or have become museum pieces, they still live on in the hearts and memories of people. The KL-SG HSR will symbolise modernity. Its speed may take away the magic of a leisurely travel on regular trains. There stands a train of times past at the back of Muzium Negara in Kuala Lumpur to remind us of its glorious days. It is this nostalgia for train travel of days gone by that makes heritage railways a popular tourist attraction. Before the days of highways, trains were the favoured mode for long-distance travel in Malaysia. For the price of today’s Starbucks coffee, as a student many, many years ago, I could afford a third-class return ticket from Kuala Lumpur to my kampung, Sungai Petani. Growing up, I remember watching from my uncle’s railway quarters locomotives shunting up and down at the Prai shunting yard. Those were iron behemoths belching out smoke. They sped away unencumbered by the coaches that they would pull, as the steam from their engine room compelled the connecting- and coupling-rods attached to the wheels to work furiously. It was memorable to observe a water stop where a locomotive replenished its water supply through a rubber chute that hung out from the spigot arm of a huge water tank at the train stations. I remember the platform tickets we had to buy to send off friends and family at the station. I recall, too, the underpasses at the old Kuala Lumpur railway station that we had to traverse to get to the other platforms. I recently went on a few train journeys in the United Kingdom. Most of them ran on time. The few that did not were delayed by signalling failure or the inclement weather at this time of the year. Constant communication to keep the commuters abreast and the handing out of tiny mint-sweet boxes that displayed the website where passengers could file their compensation for delays beyond 15 minutes relieved the misery of the commuters. This is in sharp contrast to the Japanese rail system. Like the Germans, the Japanese are obsessed with time. Japanese trains, especially, have a track record of punctuality right to the minute. Even during the Fukushima crisis, Japanese bullet trains — the much-admired Shinkansen — ran punctually. Chinese high-speed trains are another marvel. Running at break-neck speeds, they can cover the equivalent distance from Johor Baru to Butterworth in about two hours. Similar speeds prevail on trans-European trains, such as the Eurostar and the French TGV (now renamed InOui). Keretapi Tanah Melayu (KTM) has come a long way since the days of the steam engine. Diesel-powered, air-conditioned trains now ply the cross-country routes. Electrified dual tracks along some parts cut journey times by as much as half. Despite these developments, KTM has still a way to go in delivering better value to customers. Recently, my Sri Lankan friend and his family were travelling in this part of the region. They wanted to come over to Malaysia after touring Singapore. Alas! KTM had discontinued its south-bound night-sleeper service. But all was not lost. A 24-seater bus amply compensated for the absence of train travel. 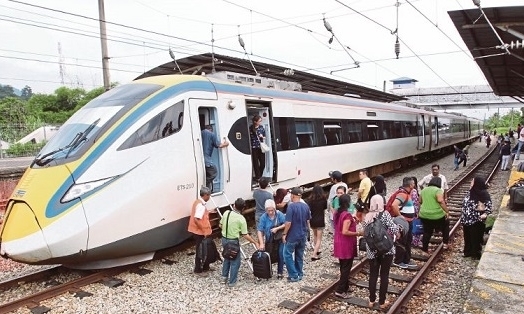 The high-speed rail (HSR) connecting Kuala Lumpur and Singapore that will come into operation in eight years will open up a new era in rail travel. HSR trains can whizz their way across the countryside quietly and comfortably at speeds of more than six times that of regular trains. They will be a lot less polluting than other alternatives. HSR, the first in the region, will help rebalance our economy. It will shift business patterns as increased passenger traffic pours into the cities it will serve. As it zips past the lesser developed cities of Muar and Batu Pahat, HSR will bring in tourists, infrastructure investments, urban growth and jobs to those cities and beyond. Property and commercial development along the route will intensify as companies and multinationals set up operations along them, given the ready logistics. Through the multiplier effect, the RM65 billion-odd investment will enrich the larger economy. HSR will bring Malaysians and Singaporeans closer together. It will promote economic integration between the two countries. Surveys in China show that more than half the passengers on its busiest lines are those who would not otherwise have made the trip. This is undeniably good for creating a deeply connected economy. It means that the HSR will enhance labour mobility and enlarge the talent pool for companies along its stretch. Even as we accelerate to world-class rail travel with our HSR, we should not neglect investments in existing rail services. We could perhaps even bring back the south-bound trains. KTM will continue to serve the man with modest means, those wanting nostalgia and those who want to enjoy the countryside idly gliding by.